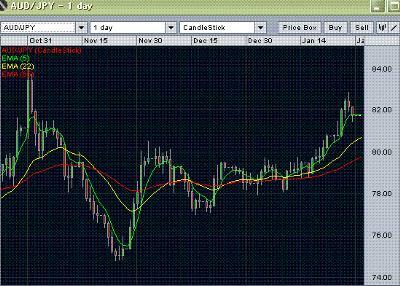 AUD/JPY moved the way we had indicated during the last weekend. We had mentioned a move towards 82.80 but the currency pair moved a bit more to 82.85 before finding some resistance there. The resistance took it down to 81.43 before a weekly close at 81.73. The interesting pint to note is that the resistance came exactly at the previous to previous high of September 1st, 2011. Our outlook stays same for some more upward move but we need to watch for a couple of points. The downward move for past 2 trading days indicate that we cannot ignore some more downward correction. Hence on the downside we need to keep an eye for a break below the recent 81.43 and then 81.40. Such a break should bring some more downward correction towards the range of 80.65/80.60 (22-days EMA) to 80.45 ((daily Ichimoku cloud’s Kijun-sen support level). Here the psychological support of 80.00 will also start working. Only any firm break below this will change our short term focus for some convincing downward move towards 79.20. As we mentioned that we expect some more upward moves, a break over the recent 82.85 (also Sep 1st, 2011’s resistance level as mentioned above), should bring further gains towards the recent high of 83.95 (October 30th, 2011). This level should bring a strong resistance and a break over that will open the door for a move towards the psychological 85.00 level first and then 86.20. You may also check daily technical aud/jpy analysis, weekend audjpy forecast and eur/jpy at ForexAbode.